Freediving is an innovative sport combining grace, discipline and the will, which allows developing many new physical capacities. Despite its millenary existence, freediving has become a well-known and widespread in the world and has only recently appeared in Moldova, but has already managed to conquer the hearts of many people. 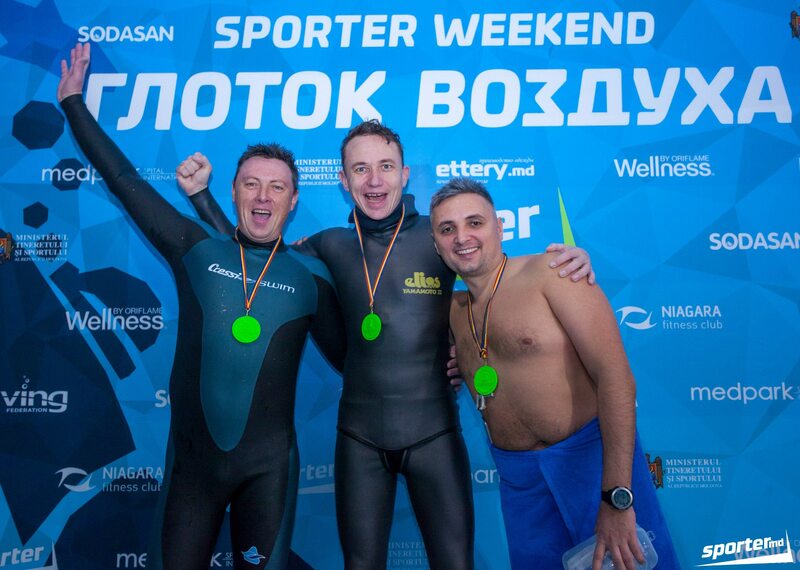 The first freediving championship in Moldova was held in 2013 and was more a “test”, study, and entertainment, than competition, but it did not prevent our sportsmen to register the first national records. The 2013-tournament (see photos and video here and here) was attended by 28 braves, including four women, the older was 61! Among the women the best results showed Anna Daschevici – 1 minute 11 seconds, and in dynamics – Tatiana Ursu – 40 meters. Among men, the absolute champion was recognized Dmitrii Volosin, who gain the lead in both disciplines: 5 minutes 29 seconds in statics and 110.5 meters in dynamics. The competitions were held in three disciplines: ”static apnea”, ”dynamic without fins” (see the description to disciplines below). Depending on the results, the sportsmen acquired points (1 point for each 6 seconds in statics and 0.5 points for each 1 meter of distance in dynamics). The winner was the diver, who acquired more points according to the results in all three disciplines. This time the 2014-championship (see video and photos here and here was included in the official calendar of competitions of the Ministry of Youth and Sports and was attended by about 50 sportsmen, who decided to challenge themselves. Among them was the champion of the previous year – Dmitrii Volosin, and the representative of Belarus – Alexandr Borisevici, who had come in Chisinau especially for competitions, and even two older women – Ludmila Protasova and Liubovi Metlova, who participated in the championship in 2013. It is noteworthy, that the second championship in 2014 have established and officially recorded two national records: Dmitrii Volosin – 5 minutes 50 seconds in statics and Vadim Jurov – 112 meters in the dynamics in fins. All results can be found here. This 2015 the competitions are planned more ambitious, and already are the international event, which is held under the auspices of “AIDA” international organization. “AIDA” – is the International Association of Apnea Development, whose mission since its inception is the keeping of and recognition of records, as well as the organization of competitions in various disciplines of apnea, for the purpose of keeping of tables of current records, and the list of champions. Accordingly, rules and standards are also established by AIDA. Official website. 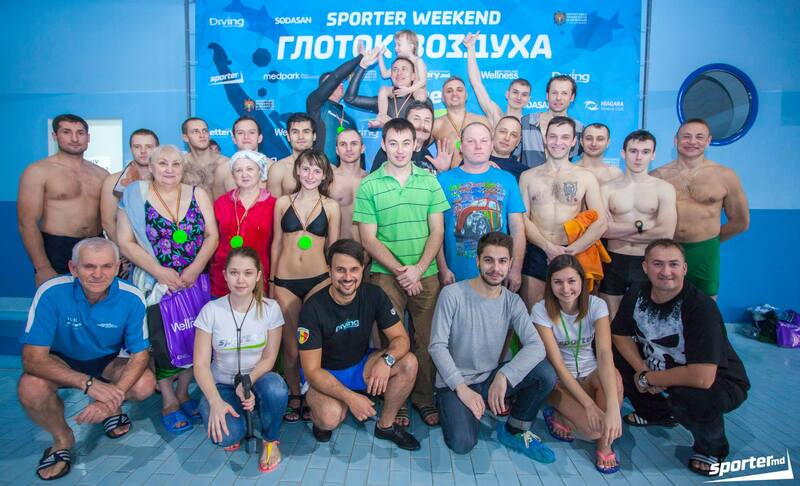 The competitions, organized by the public sports organization Sporter.md together with the Federation of Underwater Activities of Moldova, under the auspices of AIDA will be held on 12 December in pool of “SportPark” fitness club. Registration starts at 8:00 a.m.
Everyone, men and women are allowed to participate in. If you are under 18 years old, you must have written permission from the parents. All participants must have a copy of the identity card and AIDA medical certificate with the seal of family doctor! (AIDA Medical statement can be downloaded here). The competitions will be held in three disciplines: statics, dynamics in fins and dynamics without fins. The winners among men and women will be determined according to all the results, obtained in all three disciplines. They will receive gifts from competition partners. See the Rules of the championship here. The new sport for our country is rapidly gaining its audience and does not leave different, attracting by its naturalness and extremity. So, the participants in the competitions can easily come up with a support group, because the audience will not be bored. Warning! All participants, audience who want to have access to the pool, shall have second pair of shoes and clothes! Otherwise they will be not allowed! *Static apnea – is holding the breath under water in a static position. The result is recorded at the time that the athlete spent under water. *Dynamic Apnea – is swimming underwater breath-hold. The result is recorded on the distance covered by the athlete. *Apnea – is a complete conscious cessation of breathing under water for a certain period of time. (By itself, the term Apnea refers to the involuntary stop breathing during sleep for 10 seconds or more).